Jen Mueller, America’s Expert Talker is rarely at a loss for words. A 16-year sports broadcasting veteran, Jen currently serves as the Seattle Seahawks sideline radio reporter. She is also part of the Seattle Mariners television broadcast team on ROOT Sports. In addition to her work on the sidelines, Jen launched Talk Sporty to Me in 2009 and teaches business professionals how to improve communication and leverage fandom in business. She is the author of two books and a graduate of Southern Methodist University. Sports and sports fans are everywhere and using sports talk at work can help start conversations and open doors. Sports talk can build your business relationships, help you network more effectively and improve your business communication. 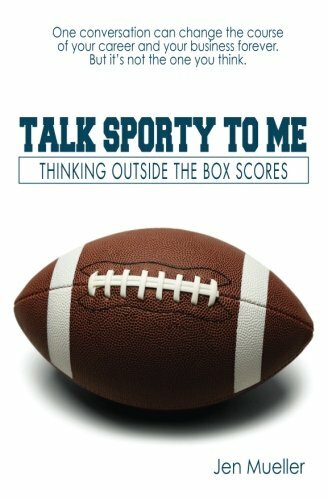 Sports talk is one of the most universally accepted “small talk” topics. In this conversation Jen shares her personal career journey of being a sports producer to becoming an on-air sports broadcaster. Do whatever you need to do to follow your goals. Sometimes that means working on your goals on the side while you maintain your current job. Sometimes that means saying “"I'm willing to do that job, and..." Take the opportunity to communicate additional long-term goals you have and plant the seed for what you want to do in the future. In surveys each year, more than half of all Americans say they are sports fans so you can go into a room and know that you can make a connection with many in the room with sports talk. Sports talk can give you something to talk with the CEO or new Account Exec or that new customer. Stacy and Jen discuss how sports fans can be found in all roles and functions in an organization and how talking sports can put you on the same footing as others in your organization. Think of sports talk as a relationship building opportunity and networking capability. The conversation about sports will eventually change into other business topics and you want to be sure to be a part of that conversation. Stacy and Jen discuss ways about how to come up to speed on sports topics so you can jump into that conversation at work. Jen recommends even if you don’t love all sports, getting a few key points from the games over the weekend can be a game changer for your career. Stacy introduces Jen and we hear Jen's career journey. It may seem like a short-term lateral move but longer term, is there more opportunity for growth? Did you see the game? No? What did you get up to last night? Know what they're talking about - what is driving the conversation?